Problem with Lens or my Technique? I recently purchased a Samyang 16 mm lens from B&H and I did some test shots in the beginning and I was happy with the results. However last week i went to the Grand Canyon /Zion for the holiday weekend and once I'm back I'm seeing some issues with the pictures I took using the Samyang 16 mm lens. The answer is all 3 problems. 1) Lens problem. Wider angle, their resolving power is just not as great as telephotos. When you pixel peeping, nothing can be sharp. 2) Camera problem. Could it be your eyepiece, lens or mirror has been off? When you see "Sharpness" doesn't mean camera sees the same. There will be off a bit. Secondly is the camera high ISO tend to blur things. On your ISO3200 shooting the milky way, it's suppose to be blurry. Keep in mind this is no Sony A7S. Third would affect sharpness is when people tell you "size don't matter". I have both APS-C and FF sensor. I can tell you, pixel peeping, FF is simply WAY better. Due to the nature of better signal noise ratio, it will produce "natively" sharper image. Of course, if you have K3II with Pixel Shift Resolution then it's a completely different story. 3) User error. When camera resolution goes beyond 16mp, human error tend to be much more visible. Originally you believed you can handheld a 50mm with min shutter speed of 1/50s, this rule is no longer applied. With extra resolution, you can clearly see your handshaking caused the blurry image. Camera shutter shake, mirror shake would also introduce that! Try to mirror lock-up before you shoot on a tripod, then we can determine if you can safely believe that you didn't make any error while shooting. 4) Additional point people do not know about. DOF!! While we believed APS-C with F7 is clearly enough Depth of fields to cover sharpness of everything, but that's because you are viewing with "SLR optical viewfinder". Your eyes clearly can not see beyond the resolution of your eyes can see. In the other word, normally when camera tells you it's in focus, and optical viewfinder shows sharpness, do not get fooled. Actually when you use liveview mode and magnified the focus point, you will realize you probably were just a tiny bit off!!! I've noticed infinity landscape shots on my own. The high resolution sensor really shows how the image sharpness falls off from the center when using wide angle. The most important of all.. EVEN at F8, I was focusing the tree tops of a mountain, I can still clearly see sharp tree with some blurry trees right in front of it (EVEN they are equally distance from my eye sight). It states one thing! If you pixel peeping, you will realized DOF is simply BS. Actually when view real world through the scene that suppose to fall into your DOF, actually there are still "blurry foreground, background and sharp focused objects". You can easy see at 100% level looking around the focus point. I can see it on F8 all the time. Of course, you can size down the aperture to get more DOF, but then anything goes beyond the F8, your lens will give you softer image as well. So there is no 100% way of doing it perfectly. PROS basically takes multiple shots then stack focus them. If you want true corner to corner sharpness.. You can either move up to "larger" format with longer focal length lenses to cover the same "wide angle - angle of view". For example, using FF DSLR 35mm as APS-C 23mm. Since longer focal lengths, you can see much more resolution of an image, and lens won't compress the scene so much so you lose definition of actual pixel resolution. Or you can take bunch of shots with short telephoto lens, then stitch them together pretend as a wide angle. You will get super sharp image no matter what! The reason I found that out.. Simply because I recently just shot a series of landscape photos from Pentax 77mm vs Leica 28mm.. 77mm beats Leica to every single pixel as sharpness and resolution (after all, I magnified the scene). However, after stitching together, I get the same 28mm view, but I got MUCH MUCH sharper image. i can count tree leaves! This is the precise reason I don't go any lens wider than 28mm. This shot stitched 43 images together.. Using 43mm Limited on F8. In the real 100% resolution it gets to 108mp.. Covers just about as wide as 21mm. In this photo I can really count tree leaves. However, F8 simply not deep enough, the foreground flowers were blurry. However, I learnt a trick is to size down the image.. Not looking them at 100% but 75% (still plenty of resolution) but size down will bring up even more sharpness and it increases the "DOF"!! Now the foreground rock is even in the DOF. I use the Samyang 14mm for landscapes, and really I find I'm heading at least to F11 to get real front to back in-focus in similar kind of scenes. Also I have to be careful to get at least an approximate hyperfocal distance nailed, which I do in live view magnified .... the Samyangs huge tight focus throw helps here a lot. After the focusing I take the shot with a remote control .... Any subsequent shots without live view activated are done with mirror-up plus remote control. So, yes, it could be aspects of technique to look at. There's no obvious optical fault that I can see in your images ...my suspicion is that for the focus point you've chosen, with the distances in the scenes, that your apertures are not small enough. Obviously only technically perfect hyperfocal focusing will get the maximum depth for any given aperture, but an approximate 1/3rd into the scene plus an extra stop down usually gets very close to best possible. It's important to nail the focus, too. I would recommend using live magnification for that purpose. For astrophotography, however, you generally have to resort ti trial and error since there's so little light. How did you achieve focus? If you focused through the viewfinder and didn't use a tripod, then it's probably your own fault. Nowadays, manual lenses simply no longer work that way. The correct way to focus and verify lens sharpness is to focus in live-view with magnification turned on. Then take your time to check the resulting image. If it's not as sharp as comparable shots on the internet or it has uneven sharpness then it's time to return the lens. Hi All, Thanks for all the comments, @photodesignch thank you for the long explanation! I technically did not use live view focusing, I did some trial and error and then checked the infinity focusing point on the lens and for most of the shots, just set it to the infinity point and shot it. I thought the focus for infinity is pretty much standard.. Guess it does not work that way. When I tried live view with focus peaking earlier, I used to get a lot of out of focus shots and I found I could get sharper images with focusing from the viewfinder. Perhaps I should learn how to use the live view focusing correctly. And I did not turn the mirror up. I did use a tripod and remote, but not with the mirror up. Last edited by donpjt; 09-10-2015 at 08:03 AM. Yes! It is very possible any lens can focus past infinity. Using Live Magnification has made a significant difference with some of my lenses. The other issue from the OP may simply be using/not using a tripod. He could have a bad copy of the lens. Bad copies happen. Don't trust the infinity focus position on the lens. It's just there to give you a gross idea of where infinity focus is, not to fine tune it. Liveview with focus peaking and magnification is the way to go. For landscape, the smallest possible aperture value is always the best. On an APS-C camera, it usually means in the F11-F16 range. At F8, there's a good chance you'll get exactly what you see: some blur in the foreground or background. Which might not be a problem depending on what you try to achieve, but usually isn't desirable in a landscape. I found out that liveview is never accurate. you really need to magnify at least 4x to view the actual focus point. focus peaking is only for "suggestion" because it's real-time photoshop to find contrast contour lines. However, it could as well mistaking with other lines. It's possible many lenses will focus past beyond the infinity mark (due to older manual lenses needs to fit the infrared distance cart) and auto focus lenses needs to be able to go beyond infinity so they can move back and forth. so infinity mark is never really accurate. I use similar technique but from my own twist. I actually don't use the largest aperture of a lens because image is often too soft for landscape photography. However, I use one step down from largest aperture. WHY? because when I magnify into the focus point, I can clearly see what I am focusing on and what can be blurred. After I nailed the focus then I stop down further to F8 or something to get the best sharpness before lens go into diffraction. The reason I am doing this is simply due to the nature of focus peaking. focus peaking have a "suggested range" but even at F8, the focused range is quite far. I want to be able to "sharp focus at exact object" then rest sharpness just goes with it. However you are correct on hyper focus theory. I simply don't use it much. 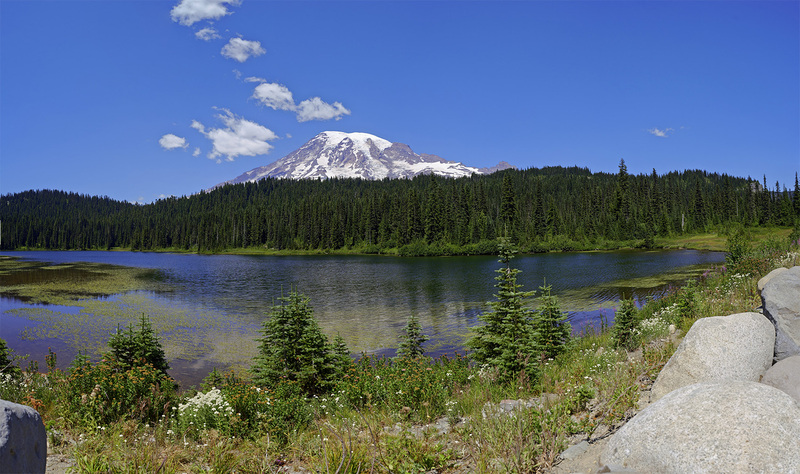 From the photos above, I didn't focus on the mountain peak, I didn't focus at lake, I didn't focus at foreground. What I did focus is the treetops before the mountain. (allows a tiny bit of blurriness to the mountain, but completely out of focus at foreground flowers and grass). By using stitching method, 108mp image is simply overkill. I have to size down anyway!! Once I size down a bit, the near neighbor pixels will blend in, basically makes up the difference for sharpness and DOF. After sizing down to about 75% of the actual image 9600x7200, My foreground became falls into the DOF by magic, so is the mountain peaks!!! Obviously that's a cheating way. I didn't really use the stack method to achieve the stack focus. Instead, I used the traditional method called "oversampling technique". This is no differ than Nokia did on their 41mp phone or Nikon did this trick back in the days to get better image quality. It works extremely well to reach super sharpness for me. Went through my pictures again and from all of the comments above, I do feel it might have been due to an error in focusing.. See the below picture taken with the same lens taken again at F7.1 and ISO 80 and it seems sharp all over.. See the pics.. So based on everything I don't think I have a bad copy of the lens.. If I have.. today is the last day.. Let me know if anyone thinks that the lens is bad..
without sharpening, that looks just about right. The problem is I found out wide angles normally just don't have much resolving power compares to telephotos. This performance is actually acceptable. On the other hand, you might want to check the ISO you are using. The lowest ISO is 80 doesn't mean it's best quality. Simply due to the nature of sensor! If a sensor native ISO is 200, then ISO80 is an "emulation".. It's like boosting the higher ISO performance, but reverse. You can go as low as ISO 80 to make your show slower, but it's an emulation! You lose Image Quality over it! I can't speak on top of my mind what camera and what's the base ISO. Please consult to some user manuals on internet. 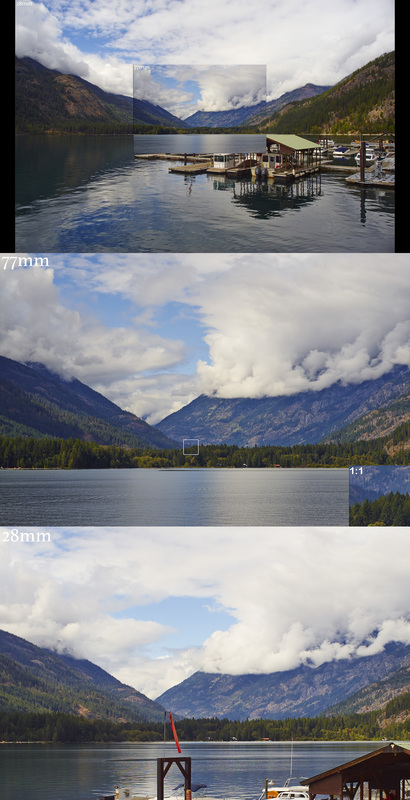 to demo my finding why I use telephoto lenses to do panorama instead of using wide angle lenses.. here is the reason! 1. first frame is how 77mm vs 28mm on POV. 2. when size down 77mm to 28mm 1:1 ratio, you will clearly see the sizing down methods gains much more resolution. 3. small window from 77mm 1:1.. As you can see the magnification works.. Even at 1:1 ratio comparison 77mm simply beats the 28mm on resolution. In addition! Judging from my 28mm 1:1, I have to say the image you've posted on ultra wide angle, the resolution of sharpness is "just about right".. It suppose to be blurry without post tone work. Thanks again for all the comments, either way I have filled in an RMA with BHphotovideo to get it exchanged and have 10 days before I send it back to check again to see if there's anything wrong..